I've put together some cat behavior facts, largely based on questions I've seen, heard, or been asked. Understanding your kitty better is the key to being able to provide optimal care. Something is wrong -- My cat stopped using the litter box. Is he mad at me? While it's tempting to anthropomorphize, cat's don't stop using the litter box out of spite or for revenge. They stop using the litter box because something is wrong in their world. Litter box problems may have either a physical cause (e.g. pain, urinary tract infection, constipation, systemic disease, etc.) or a behavioral cause (e.g. poor box location, ambushed by other cat, smelly box, etc.) at the start. Cats will sometimes continue to refuse to use the litter box even after what was wrong has been fixed, due to habituation. 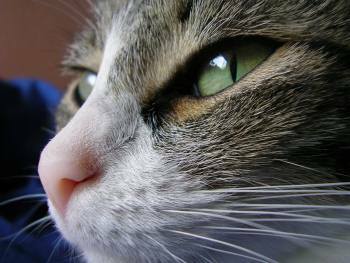 Note: Cats who are declawed are said to be far more likely to have behavior problems, including litter box problems, and are therefore more likely to be relinquished to shelters as adults (this has also been disputed by some). Nevertheless, inappropriate elimination and related cat behavior problems can often be solved with some patience, consistency, and creativity on your part. Expose me to new things -- Why does my cat run and hide from strangers? Many cats are not properly socialized as kittens, and their reaction to possible danger is often to run and hide. Making an effort to socialize your cat as young as possible can help your cat adjust to strange people, strange surroundings, and strange things. Cats that have several human handlers as kittens will be more likely to be outgoing and secure. Safely expose your kitten to as many adults and children, other animals like dogs, and situations as possible. Even old cats learn new tricks -- How do I get my older cat to be more confident? Cats who have had bad experiences early in life, were separated from their mothers too early, or weren't properly socialized may exhibit fearful behavior all of their lives. Even older cats who are fearful, however, can come out of their shells and acquire more confidence. With lots of kindness and understanding, you can slowly introduce your scaredy cat to new experiences and build her confidence. One of my cats, Priscilla, had a rough life as an abandoned kitten. At a year old, she was afraid of just about everything. It took years, but by providing a loving and safe environment for her, and slowly exposing her to new things, she became confident enough to come out of her shell and start meeting new challenges. No bones please -- "Grooming is their comfort activity of choice" says cat behavior expert Arden Moore, author of The Cat Behavior Answer Book: Practical Insights & Proven Solutions for Your Feline Questions (Amazon). While chewing on bones for relaxation is common for dogs, cats would rather take a self-induced tongue bath. Self-grooming performs several functions for the cat. They use their barbed tongues to clean their fur, but it also seems to calm them down (some cats will groom excessively when stressed, or very rapidly when excited). Self-grooming cleans their fur, smooths their fur into place (like using a comb), and wets the fur a bit, cooling down their bodies. They also lap up vitamin D from their sun drenched fur. I like the sink -- Why do cats drink from the faucet? Many cats seem to prefer running water to what's in the bowl, even if the bowl water is filtered and fresh. In nature, running water is bound to be fresher than still water, so it's believed that cats naturally gravitate towards moving water over still. "Many cats go out of their way to drink from a dripping faucet rather than use their more convenient water bowl. The simple reason is that they instinctively recognize running water to be fresher than still water. A cat in the wild will always choose a clear, running stream over a rain puddle."